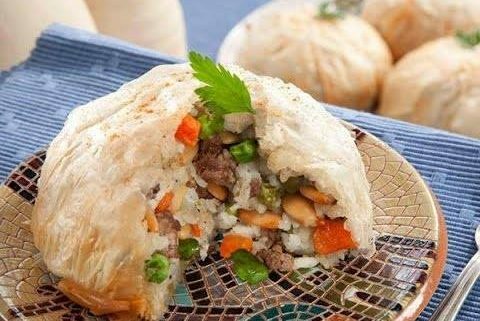 A decadent and luxurious meat pie from Damascus, auzy combines a filling of spiced ground beef (halal), rice and green peas, mixed with almonds and pines nuts that have been fried in butter. This filling is wrapped in a delicate, crispy phyllo pastry shell, and brushed with butter and eggs that give it a beautiful golden colour when it is baked. Auzy is often made for wedding celebrations, family gatherings, or holidays like Ramadan or Eid. The vegetarian version made with rice, carrots, green peas and cremini mushrooms, enriched by butter-fried almonds and pine nuts. A relative of hummus or baba ganoush, this is cool and refreshing meze dip is made with zucchini, yogurt, tahini and mint, seasoned with olive oil, and garnished with parsley. Fattoush is a popular Levantine salad made with toasted or fried pieces of pita bread combined with mixed greens, fresh vegetables like tomatoes, cucumber and radish, but recipes vary according to season and region. Fresh mint and parsley lend freshness and complexity, and dried sumac (the same staghorn sumac that grows here in Ontario) gives the olive oil-based dressing a distinctive tangy flavour. Ghraybeh is a delicious and delicate Middle Eastern shortbread that melts in the mouth, flavoured with vanilla or rosewater, and garnished with pistachio seeds. Newcomer Kitchen’s weekly pop-up take place on WEDNESDAYS. We also offer 1 “Guest Cook” spot to help/hang out in the kitchen, learn the recipes and join the ladies for family meal on Wednesday (10:30-4:30). We are asking for a $50 donation for this, which will go to topping up the $ we have to share with the cooks. This is available for purchase online, on a first-come, first-served basis. Proceeds from the sale of meals goes directly to the newcomer cooks. However this does not cover the costs of the enormous amount of behind-the-scenes coordination required to keep this project going. You can help the Newcomer Kitchen project directly and our vision of expanding this model to support more women in more neighbourhoods!